In the upcoming sequel Fantastic Beasts: The Crimes of Grindelwald, the Harry Potter universe will extend even further, introducing new characters and venturing into further corners of the world. Magizoologist Newt Scamander (Eddie Redmayne) is called upon by the young Dumbledore (Jude Law) to track down dark wizard Grindelwald (Johnny Depp), in a journey that’ll take him to Paris. 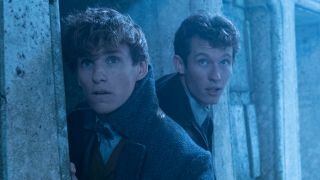 Among the new characters introduced this time around are Theseus Scamander, Newt’s war veteran older brother who’s played by British actor Callum Turner. They’re something of an odd couple of siblings, as they don’t see entirely eye-to-eye, which should ensure that sparks fly when Theseus comes along for the ride. Fantastic Beasts: The Crimes of Grindelwald opens on November 16 in the US and the UK, and you can read more about it in the new issue of Total Film magazine when it hits shelves this Friday, September 21. Inside you’ll also find the latest on Creed 2 and Bumblebee, as well as in-depth features and interviews for First Man, Halloween, The Girl in the Spider’s Web, Overlord, and much more.